I remember owning a small version of Robert Louis Stevenson's A Child's Garden of Verses as a child. I read and enjoyed lots of other poems, too, but it wasn't until my early adulthood that I really fell in love with children's poetry. My mother gave me A. A. Milne's When We Were Very Young and Now We Are Six. I read them aloud to my newborn daughter, and then went on to Favorite Poems Old and New (Helen Ferris, editor). I loved the simplicity, humor, and freshness of the child's point of view. Some of my earliest writings were poems, a few of which are in this book. Over the years most of my efforts have gone into stories, but every now and then I'd write another poem or two, most of them about nature. A poem is such a great way to capture a moment or image in the ever changing natural world. Each season has it's own special magic. Reading through my poems in 1993 I found I had nearly enough nature poems for a book. I organized them, wrote a few new ones to fill in the gaps, and started thinking about the illustrations. I wanted to do something special, something that would really make the book stand out, but I didn't know what. I set the poems aside and worked on other projects. About that same time my mother began making quilts . I admired her work, and enjoyed looking through her books and magazines at all the beautiful designs, a lot of them scenes from nature. The thought of illustrating my poems with quilts came to me, but seemed to crazy to even think about. It would take so many and they'd have to be so small. I pushed the idea aside, but it didn't go away. My mom with the quilt we made for her. (Story of Mom's Quilt ) In 1995 the family decided to make a quilt as a surprise for Mom. 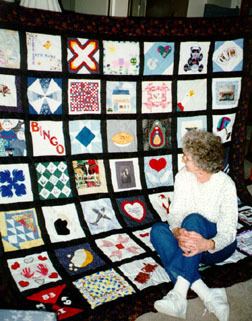 Each of her siblings, children, grandchildren and friends made a square to add to it. I made several squares, coming to the assistance of family members who were too busy or unable to make one themselves. As I worked on them I had questions to ask Mom. To keep her from being suspicious, I told her I was thinking of making quilts to illustrate my poems. Mom seemed surprised, but she didn't look at me like I was crazy. Instead, she got out more books for me to look at, and collected scraps of fabrics for me to experiment with. The following summer at Mom's dining room table, I created my first quilt for the book, "Good Heavens". I drew the design with crayons on manila paper, traced it onto freezer paper which Mom recommended as a foundation , and began sewing. I sewed each strip and then sewed the strips together. Yellow suns and white moons and stars appeared on a background that changed from deep greens to blues. It worked! I could do it! I sketched more designs, put them together into a dummy and took them to Susan Hirschman, my editor at Greenwillow Books. She thought the fabric picture was beautiful, but far too much work for a book of poetry. Poetry doesn't usually sell very well and Susan was afraid I'd spend hours and hours and not be very well rewarded. I showed the fabric piece and dummy to a couple other editors. They weren't terribly enthusiastic either. I decided none of them could see my vision unless I made more quilts. Over the next two years, in between other projects, I created five more quilts using a variety of techniques. For "Ballet" I used paper-piecing . "Take-Out" is done with appliqué . The "Winter Trees" pair are done with colorwash and appliqué. And for "Do You Know Green?" 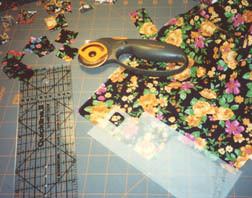 is used strip piecing . For the latter I also tried my first designing on the computer, using a simple program called Corel Photo Paint. I took my poems and the six quilts and went back to Greenwillow Books. This time, Susan said, "I still think you are crazy to do so much work, but I want to publish the book." She and Virginia Duncan, Senior Editor, weeded out a few of the poems. 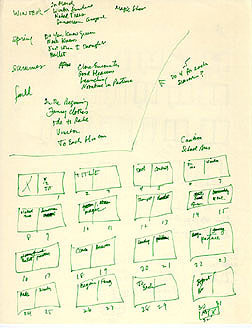 Virginia suggested showing, on the poetry pages, how the pieces of fabric go together to make the images. She also suggested adding a couple pages at the back to describe the processes of piecing and quilting. I liked both ideas, wrote four new poems and and set to work on the quilts. 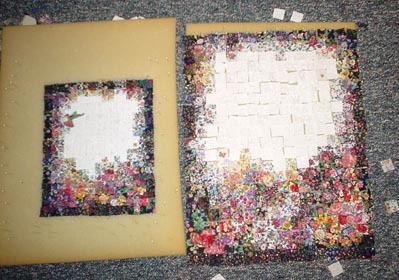 In April of 1999 Pieces became my first priority. By that time I had purchased more than two hundred pieces of fabric, mostly in 1/8 yard strips. I organized them by color and spread them out on my studio floor. Some designs I simply sketched, others I worked up on the computer, learning the rudiments of Photoshop as I went. I found it helpful to try some color possibilities before cutting hundreds of tiny squares of fabric. 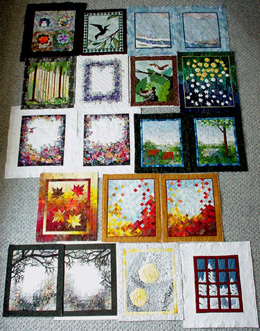 For the colorwash quilts, such as all three autumn leaf quilts, and florals of spring and summer, I laid out the little squares of fabric on sheets of foam rubber, trading one color for another until I got the hues and lights and darks to move through each piece the way I wanted. It was a bit like working a puzzle, trying different pieces until I found what worked. Often I had to cut new squares, or even go shopping for more fabric with the right shades. Each square starts out 1 and 1/8 inch on a side. When the squares were sewn together one quarter inch of each side disappears into the seam, leaving only the 5/8 inch center showing, so I had to pay careful attention to what was in the center of each little square. I made a little template with a 5/8 inch hole in the center so I could choose just where to cut. See what a big difference in size after the squares are sewn together? Each of these has 21 rows of 17 squares, a total of 357 squares for each quilt. The hummingbird is cut from printed fabric. Using a twenty-five year old Singer sewing machine I sewed the little squares together in strips and soon learned that I needed to be very precise. Working that small, sewing a seam even the tiniest bit off could create bigger problems later on. I made a lot of use of my seam ripper--a handy little devise my Aunt Esther calls the "frog tool"...."Rip it. Rip it. Rip it." I took seams apart and sewed them over again, sometimes two, three, or even four times. That summer I made another visit to my mother. 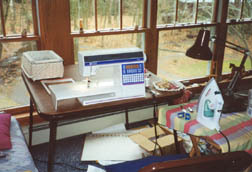 I was hand-quilting many of the quilts, but some I wanted to quilt on the sewing machine. Mom showed me how and I had great fun using her nice Husqvarna machine, stippling the centers of Winter Tree pair and, sewing through tracing paper to quilt a pattern of leaves on the autumn pair. Back home I tried quilting on my old Singer, but it was impossible. Now I had the excuse I needed to buy a new machine...one that would not only quilt, but would hold it's tension and not eat the corners of the fabric. I chose a Husqvarna and happily finished piecing and quilting the remaining quilts. 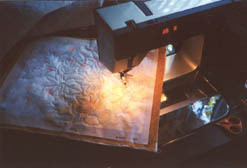 Once the machine sewing was done I still had hand-work to do on many of the quilts. Some were quilted by hand, and some had appliqué to add. On April 1st I had six quilts pieced, two quilted. On December second I delivered nineteen finished quilts to Greenwillow Books. Everyone was delighted. 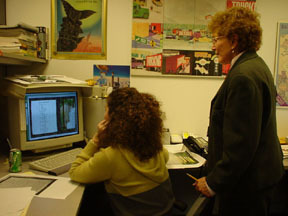 The art director , Ava Weiss, had already sent one of the quilts for a test and learned that they could be scanned directly, the same as an illustration done on paper. That meant we did not have to have the quilts photographed. Great news! Virginia is holding the final dummy I made to show just how I wanted the book laid out. Ava is to Virginia's right and Susan to her left. After they admired the quilts they took me out to a very nice lunch. In March I went in to work with designer Sylvie Le Floc'h to cut and paste the designs for the poetry pages. Here, Sylvie and Ava are working on the type layout. We still needed a jacket and I had several sketches but none was deemed just right. Ava felt confident that they could come up with a composite for the jacket using elements from the interior quilts. We all knew it had to be beautiful, appeal to children, show all the seasons and catch your eye from across the room. Sylvie hadn't come up with a jacket design yet, and though they told me to wait, I had an idea I was eager to try. I told them I was going to do it and if they used it fine, if not that would be all right, too. I spent three days designing, and eight days cutting and sewing the 500 or so tiny bits of fabric to make the quilt top. When I took it in everyone was pleased. Ava and Virginia helped me select the photos and decide what to put on the last three pages. It seemed like a lot of material, but, like magic, Sylvie and Ava made it fit beautifully. Except for looking at proofs my work was done, but the book still had a ways to go. Proofs were made, changes ordered, and more proofs made until Ava and all were happy with the results. 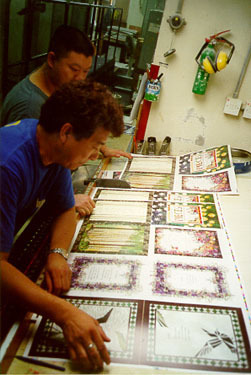 Then the book was printed in Hong Kong, with Ava on site to make sure it was done just right. 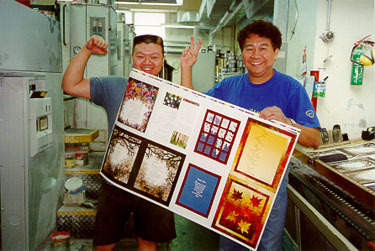 Here, printers in Hong Kong are checking the prints against the final proofs made earlier. Now we just have to wait for binding and shipping and marketing and the publication date! Winter Lights: A Season in Poems and Quilts: My third quilt book, 2005. Starred Review Hines raises the bar considerably for illustrators working in fabric, pairing 20 new or previously published seasonal poems with spectacular quilted and appliquéd piecework scenes. Reproduced in roughly actual size, each piece features combinations of printed and patchwork flowers in glorious profusion, sturdy trees with and without leaves, sunbeams, starry skies, falling rain, and stylized but recognizable animals, all demonstrating dazzling mastery of color and pattern. Though it seems almost unfair, the poetry is brilliant too, evolving the "patchwork pattern / making up a year," from the freshness of early Spring--"Brand new baby yellow green / bright bold biting busy green / until it seems/ everywhere one goes / green grows" through a summer lawn "astronomical / with dandelion blooms," to Autumn's falling leaves--some float / lazily / wavily / and taking all / daysily..." The quilts each have unique individual characters, but there is a strong overall consistency of style too, and since they were designed as illustrations, the unity of text and picture is (paradoxically) seamless. And they are so exquisitely reproduced that the temptation is to touch the page to feel the fabric. Hines explains in a postscript how the quilts came to be, and provides sources of information for novice quilters--but even readers with no interest in the craft will stop in their tracks to admire this tour de force. Starred ReviewThis lovely book combines the intricacies of quilting with the wonders of the changing seasons. Though it is older readers and adults who will appreciate the skill that has gone into the artwork, children will simply revel in the colorful pictures that make up Hines's quilted squares. For the spring, a rippled quilt in melting snow shades of white and blue captures the watery beauty of the season. In autumn, reds, golds and browns show leaves "as pretty as snowflakes." Perhaps the most powerful spread is a winter scene in which naked limbs of trees and dark flowered underbrush are set against a background of white. With such impressive pictures, it's easy to lose sight of the poems, but they are quite nice in their simplicity: "Sometimes in winter / while I'm sleeping / through the night / inside the house / all snug and tight / outside / the world is turning white." A two page spread at the book's conclusion tells "the story behind the quilts," detailing in words and photos how they were made. A bibliography is appended. A thoughtful, lovely offering. Starred Review In a series of designs worthy of exhibition, Hines illustrates the theme of deceptively simple, unique collection of poems; "Pieces of the seasons/ appear and disappear/ in a patchwork pattern/ making up a year." Her language, both playful and adroit, allows readers to see familiar seasonal changes anew. "Good Heavens," for instance, depicts a spring lawn as "astronomical / with dandelion blooms" that fill the green sky with "a thousand suns / and then / a thousand moons." Hines varies her quilt designs as often as she varies her poems' rhythm and rhyme schemes. 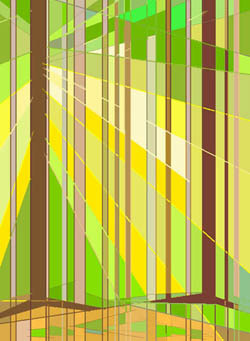 On one of the longer poems, "Do You Know Green?," the words trickle down the page, much like the light that filters through the trees in the accompanying quilt; both the poem's construction and the long vertical tree trunks emphasize the forest's height and grandeur. 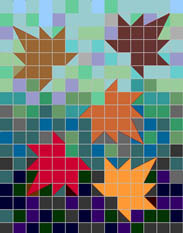 Meanwhile, abstract quilts like the one featuring hundreds of flowered squares in "Misplaced?" stress frivolity'in this case, a joke involving a flowerbed where "bloomers are not sleepy heads." 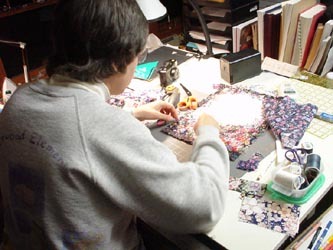 An appendix explains Hines's meticulous quilting process. Wearing two hats, Hines takes her quilter's stash of fabric swatches and her wordsmith's metaphors for memories of the seasons, and pieces together a unified, artistic whole. An outstanding book for aspiring quilters or anyone at all. Ages 5-up. 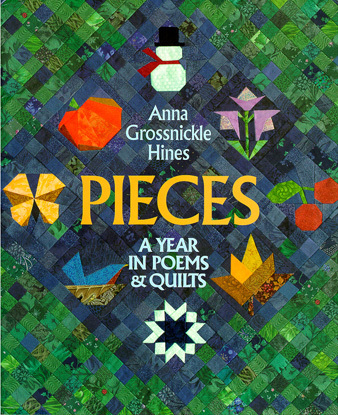 Pieces: A Year in Poems and Quilts is another gem of a book with sewn illustrations. It illuminates the seasons with simple poems and striking quilted pictures. The book has been handsomely designed, with the poems well integrated into the quilts and borders on each page. Poetry has been described as another way of seeing the world, and Hines' short poems give the reader new glimpses into the beauty of the changing seasons. What really took my breath away, though, are her intricate quilts, pieced together over several years. Each hand-sewn piece beautifully interprets nature and conveys the essence of its companion poem. It's difficult to pick one favorite to share, but I'll try: Winter Sunshine reads: "Today it is December./ Time for winter weather/and the air is frosty chilly,/ only.../ No one told the rosebush/ and it has two yellow blossoms,/ two spots of sunshine/ to warm away the cold." Two roses sewn from triangles of yellow fabric in various shades and patterns, are set against a black-and-white background made up of floral prints, squiggles and other designs. An afterward explains how Hines came to make the book and gives information about quilting and further resources. Anna Grossnickle Hines was daunted by the idea of illustrating an entire picture book with quilts. But she had gotten hooked on quilting and wanted to give it a try. 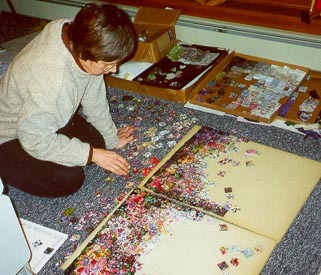 So Hines, author and artist of numerous picture books, did the book in pieces, making the quilts one at a time over four years. The result was well worth her lengthy labor. The quilts are spectacular in their design and colors, while the poems range from playful to poignant. The book's title poem sets the stage: "Pieces of the seasons/Appear and disappear/In a patchwork pattern/Making up a year." From there, Hines goes on to write about crows, dandelions, wrens, autumn leaves and snow--all of the things that make up a year in the natural world. Hines also has a good sense of humor, as shown in poems like "Ode to a Rake": "In the wind/the leaves fall/ floating/ fluttering/ pretty as snowflakes/ except.../ they don't melt." As a bonus, Hines concludes with showing how she did the quilting for the book and giving sources of more information about quilting for readers who might be interested in trying it themselves. The publisher aptly calls this book "a happy blend of stitches and stanzas." In it the author-quiltmaker relies on carefully observing and appreciating the seasons and on her mother's example of designing beautiful quilts. The result is a unique and delightful children's book. The quilts are not in traditional patterns, but instead depict freestyle scenes or moments from nature's annual cycle. A combination of white, gray and mud colors characterizes March. But the master touch is that the quilt strips are long and narrow, running from upper left to lower right -- like slashing rain. Between the brightening clouds curved above and the slush of puddles and waves horizontally below, there is enough grayish room to overlay the text of a poem about squishing mud, or another, on the opposite page, about a "great day for clouds." The quilts are wonderful, the poetry is good, and the combination is unique and in the tradition of good picture books, very well integrated. An appendix tells the story behind the quilts and briefly (with illustrations) explains the basics of quilt making. A short bibliography - including a Web site - offers an introduction to the craft and a start for would-be quilters. For readers 3 to adult. As summer ends and fall begins, these poems invite readers to embrace the last of this season and look forward to those that follow by reading through this book. 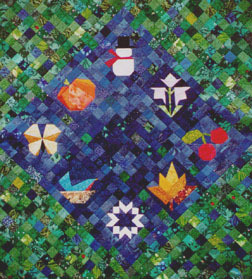 Each poem is accompanied by a quilt of Hines' design and creation, and she provides "The Story Behind the Quilts" in the concluding pages of the book. For readers who might want to try quilting, she provides a Web site to begin their research, as well as some books to consult. Of course, some readers might just want to return to the poems again and again and appreciate the beautiful marriage of word and image, as in "Mirage": "Oh, phlox, I like/the way you make/the garden floor/a purple lake." A feast for the senses lies between the covers of this book. Eye-catching handmade quilts, created by Hines herself, are the backdrops for twenty of her poems about the seasons. The first poem, "Pieces of the seasons/ appear and disappear/ in a patchwork pattern/ making up a year" sets the stage for what is to come. The poems present the sights, sounds and smells of the seasons, beginning in early spring with a crow alighting on a cedar branch. In subsequent quilts, pastels give way to multi-hued flower beds of summer, followed by the orange and yellows of fall, that give way to shadows and the ice blue shading of a winter night. The poems beg to be read aloud, with strong rhythms, strong images, delightful use of language and onomatopoeia. Hines presents the story behind the quilts and discusses her process at the end of the book. She dedicates the book to her mother who gave her the sage advice: "If that's what you want to do, that's what you should do." Anna Grossnickle Hines has sewn a book of poems. Actually, the poems, which she wrote, are printed on top of quilted backgrounds, which she made. The effect is that of something fixed yet lively, flat yet soft. Hines suggests the seasons through palette and the patterns of her fabrics. She also pieces fabric into images -- a yellow rose, a dusky crow --contained within the poems. Some of the illustrations are more abstract in style than others. The poems "In March" and "Just When I Thought," for instance, are paired with rainy scenes constructed with slanting strips of blue and gray. These strips, in turn, are embroidered with swirling rows of stitches that evoke the invisible, restless air of spring. As these examples show, Hines has command of such poetic tools as onomatopoeia, rhythm and rhyme, yet it's her artful presentation of the poems that stands out. The book concludes with and explanatory section titled, "The Story Behind the Quilts," which reveals that Hines had never done such intricate quilting before. 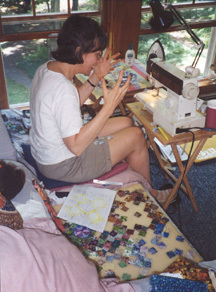 A photograph of Hines in front of her sewing machine, her hands tensed because of a mistake she has just noticed or just made, gives kids a realistic model of a grown-up working hard at something new. Although one wishes the photograph were larger, it enhances our appreciation for the artist and her task. Seams had to be re-done, the caption says, and so they were--repeatedly, if necessary. Which says a lot about this gorgeous book. If you aren't a quilter, you will be when you read Pieces: A Year in Poems and Quilts. The art of quilting has never been more exquisitely displayed than in this book. 20 original poems celebrate the seasons joyously, evoking in words what we feel as we admire each quilt. In "Ballet" the crow dances from one page to the next in slow motion. A most stunning page is that showing vertical tree trunks of varying shades of brown and green. Titled, "Do You Know Green?" you can feel the "Psst! Ping!, Pop! and Pow!" as "green tickles the tips of twiggy tree fingers,". To encourage you to try quilting, Hines tells the story behind the quilts accompanied by photos of the process. Her mom is her inspiration. 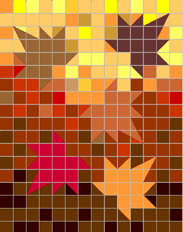 Hines has illustrated her mostly free-verse poems about the seasons with quilts. The selections, which describe weather, gardens, and animals, are set against her patchwork designs. The fabric art, done in a broad range of colors, are mostly representational, picturing animals and landscapes. While a few are striking, those that depend on a fabric's print or the quilting pattern come across flatly in reproduction. The poems are nicely descriptive, but not distinguished. The most interesting part for readers may be the two pages at the end that describe the quilting process, with a short bibliography. The quilts in the book are Hines first, and took her several years to complete. They will certainly inspire young quilters or artists to try something similar, but as a collection of illustrated poems, Pieces fails to stand out. This collection of brief seasonal poems and accompanying quilted illustrations traces the progression of the year from spring to winter. Shorter poems, such as the poem about autumn foliage called "Pageantry" ("The trees are wearing/ scarlet gowns/ and golden crowns/ and bits of them/ are falling down"), tend to be more successful than the longer pieces, which sound somewhat forced. 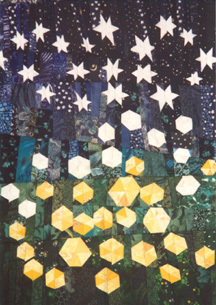 For most of these poems Hines has created cloth designs that frame the words, although a few of the quilt blocks appear to have been digitally altered to create uncluttered background space for the text. In the poem "Encore," about a hummingbird, the poem nestles in a quilted garden where hummingbirds feed, and several stitched outlines of hummingbirds on the white fabric background suggest their rapid motion in an almost cartoon-like fashion, showing the outline of where the bird was moments ago. 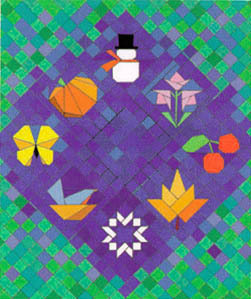 Hines also cleverly arranges the quilted art, as in a two-page spread of poems about autumn, wherein the left-hand page shows the leaves streaming down from the trees while the facing page uses a similar quilt block upside down, so that the leaves appear to be falling into piles at the bottom of the page. Despite some unevenness in the poetry, the visual appeal and detail of the quilt work will engage young viewers. 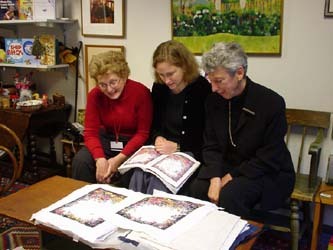 Notes about the quilt-making process are presented at the end of the book.